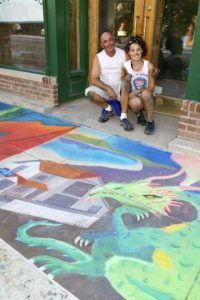 Claim the concrete as your canvas and join dozens of artists who bring the streets of Lake Orion to life with color! $1,500 in prizes! Categories for children and adults. The three categories are Best of Theme (Dragon), Best of Show and Youth. All categories are 1st ($300), 2nd ($150) and 3rd ($50) place. Chalk pastels provided. Your spot on the walk will be an assigned to 4 foot by 8 foot area. Side walk chalk provided, but feel free to bring your own chalk or pastels for your biggest most creative designs.